Gladys is a respectable Haida Elder and weaver who lives in Skidegate. 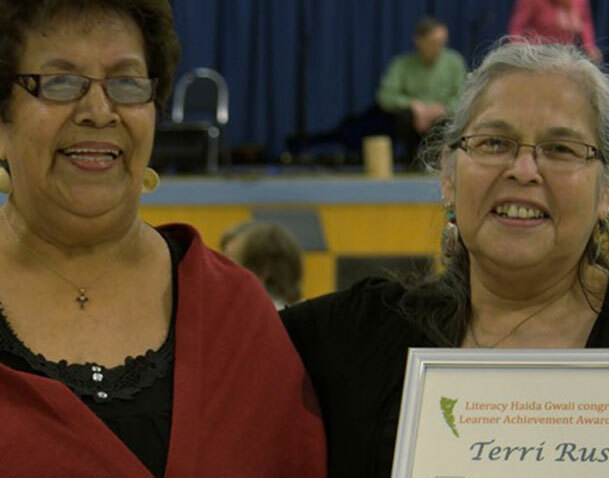 She enjoys sharing Haida stories and teaching Haida language to the younger generation. However, she also sees herself as a student. Gladys saw the need to pick up some basic computer skills two years ago as she did not want to be left behind by technology. She has progressed from not knowing how to turn on a computer to being a confident user of both apple and PC devices. Terri wants to learn a trade. She applied and was successfully accepted to study a cabinet making course with BCIT in August 2014. Knowing the importance of math in her upcoming course, she sought Literacy Haida Gwaii’s assistance in brushing up her math skills so as to better prepare herself and to ensure she will succeed in the course. Terri’s pro-active approach is an example of her strong focus in fulfilling her learning goal.